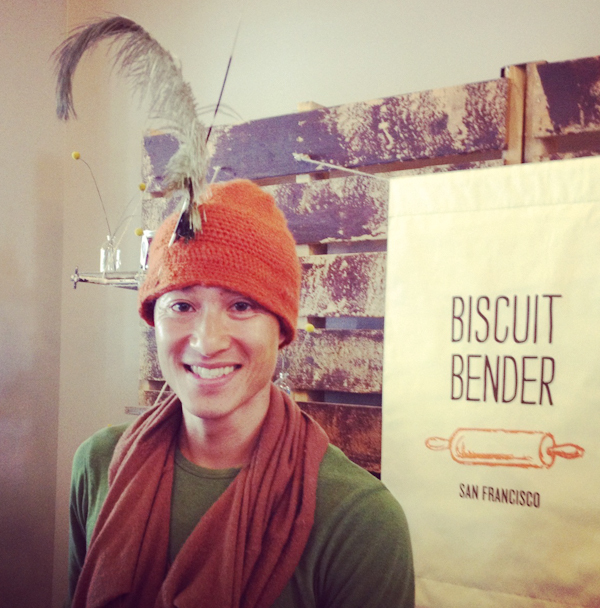 I first learned about Van Dao and his San Francisco based biscuit business while watching Chopped. Van was a contestant from my neck of the woods, and I always support hometown peeps, so naturally I was rooting for him. After watching his bio I bookedmarked his website so that I could find an opportunity to try his biscuits. Despite the fact he went home in the first round I was in love. Not only is it difficult to even attempt Chopped with only a pastry background, but he did it with style! Besides baking unique biscuits, Van creates unique hats one of which he wore on the show and certainly grabbed my attention! 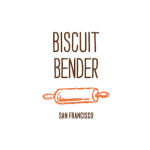 In early September, several of the San Francisco food blogs announced that the Biscuit Bender would have a permanent kiosk in the Ferry Building. I tweeted my excitement and filed the information away for the next time I was on the Embarcadero. Ever since I first looked up the offerings on the Biscuit Bender website I have had the double bacon-maple biscuit on my mind. So that is exactly what I picked up after my quick visit, along with a bottle of bacon-bourbon and watermelon-ice tea jellies. I took my treasures home and did a little tasting. It was a bite of perfection. I tried it first with the watermelon and ice tea jelly. I could not taste watermelon and think this jelly flavor will probably go better with another biscuit flavor or alone with cheese. 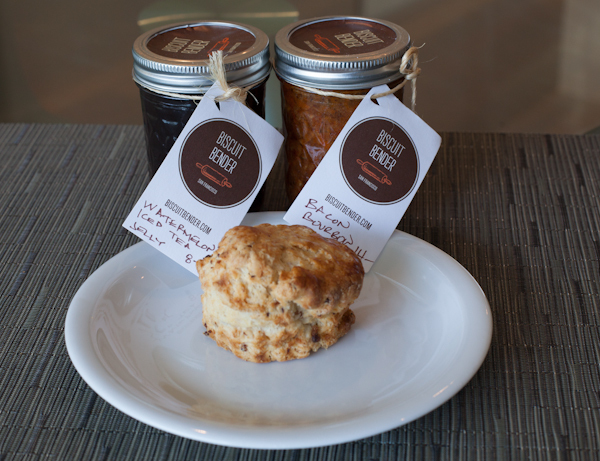 Then I tried the biscuit with the bacon-bourbon jelly and all I can say is WOW! I thought it would be too much bacon flavor, but I don’t really think there is such a thing! The jelly on the fluffy bacon biscuit was a perfect pairing and the sweetness of the maple still comes through – I thoroughly enjoyed it and am definitely up for trying some of Van’s other flavors. I’ve got my eye on the corn-jalapeno next! So if you are ever at the Ferry Building in San Francisco, please take the time to check them out. The biscuits are individually sealed and travel well. I guarantee you’ll love them! I know the people of San Francisco do…7×7 magazine just names them one of four fabulous biscuits you can get in the city! How about you? Are you a fan of a good biscuit? What is your favorite style? Mr. Dao positively looks like one of the nicest people on the planet. Folks who make bread always are. His smile and hat will stay with me for a very long time. Wonderful post, and I’m just imagining you living in that awesome American city. I LOVE biscuits — what a wonderful find. The corn-jalapeño biscuit sounds like heaven. @Ann, I will let you know how it is, I suspect it is going to be pretty darn good! I can’t help but share my disappointment that he didn’t open when I was there!! I adore biscuits! I didn’t grow up with them so it’s a newfangled appreciation but I can’t get enough now. Definitely worth a trip back to San Fran! @Lindsey, I didn’t grow up with them either (in any real sense) but I sure am a fan! Van’s are really tasty! NEXT time you are in SF you can check them out! @Jennie, I am glad you liked it! I ate that biscuit three weeks ago! We vacationed in the Bay Area for about 10 days and I just *had* to get a biscuit with jam. I think both contained bacon. Went great with the cup of coffee from Blue Bottle right across the way. I heart the Ferry Building.! @Sheri, hi there – good stuff right? I thought it was going to be “too much bacon” with botht the jam and biscuit but I guess that is just impossible! @Lisa, he must! The Ferry Building is so awesome for food in general, a great place to check out local food. I wish I had known about that place when I visited San Francisco! I love biscuits and can eat them with any meal not just breakfast. 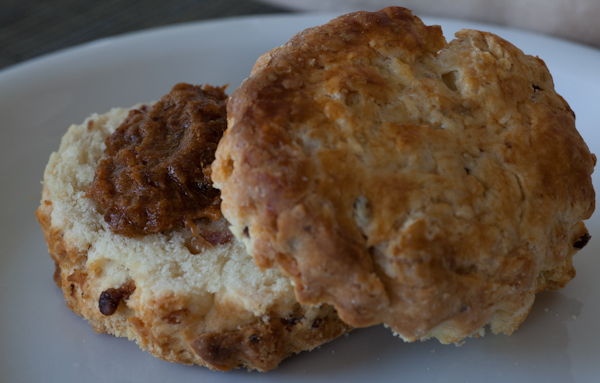 I can just imagine what the bacon-bourbon jelly would do to pump up the flavor of a plain biscuit- I need to get some! @Kylie, it is really awesome! Wow, those look amazing. I can’t quite imagine what the watermelon would taste like with bacon. I like biscuits but I’m not very good at making them. @Nicole, the watermelon was good but the subtle taste did get lost with the bacon flavor. My mouth is watering! There is nothing like a good biscuit, and those jellies sound wonderful. Such unique flavors. @Debbi, they are truly yummy! I’m obsessed with biscuits! One of my favorite foods growing up (And today) is biscuits and gravy. I prefer them savoury rather than sweet, so I think that bacon-bourbon jelly would be just the ticket. @Beeb, love biscuits, don’t often eat them with gravy, but that’s because it is hard to find good spots that do it around here! Those look amazing! I wish we had more unique places like that in NJ. @Kristen, I am sure you must! It is amazing what you find when you go looking! Jersey is fascinating to me when I see spots on the Food Network that cover their restaurants! At least you can say you tried it.